Wow, one week down and it surprisingly feels like I’ve been here and known these other students for a lot longer. InteRDom gave us a very practical orientation this week. 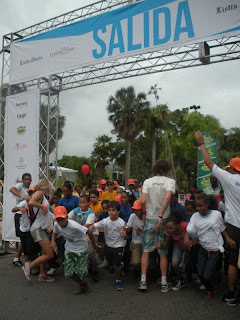 I learned about Santo Domingo transportation on Wednesday, and was lapping up in a carrito by Friday. And despite its seemingly wild streets, Santo Domingo has a new metro system that is more advanced (and smells nicer) than any one I’ve used in the United States. The taxi system is also efficient, and has helped me experience Santo Domingo’s colonial zone, the beautiful Boca Chica beach, and my first internship event. 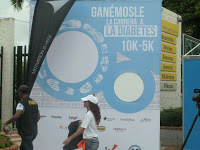 Sunday was the “La Carrerra a la Diabetes” 5K-10K run that my internship organization helped sponsor. 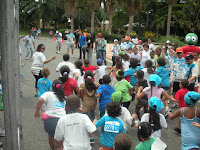 Aprendiendo a Vivir had a kids section at the race where kids could get their blood sugar monitored throughout the event, learn about their diabetes, and of course play. I had an amazing time losing to them in duck duck goose, helping with nutritional concepts, and translating for students and parents (Thank you, La Pelicula Goofy). 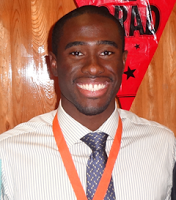 I can’t wait to get into the flow of my internships, and get better at this language. Also, feel free to search the Spanish translation of any of my posts on Youtube to discover the songs that inspired them.